There is a lot of misleading information on the net saying that the best and cheapest way to make 3 phase is with a variable-speed-drive unit (VSD). This can be very misleading. Firstly a 240V supply into a VSD will only produce a 240V version of 3 phase and not the true 415V that many machines require. Also many customer machines have control and logic circuits attached and these cannot be operated from electronic, variable speed drives. VSDs are designed to operate motors and they ramp up the output when the motor needs to start and clean 415V is not available at all times to operate control circuitry. The Phase Change Converter range will deliver a clean 415V output to any combination of machines that may be operated from a single converter unit. There is a lot of discussion about the different technologies available to create 3 phase power from single phase. Click here for information on economical VSD's carried by Phase Change Converters. Another method that can be very good in some applications is the use of an inverter or VFD / VSD (Variable Frequency / Speed Drive).These are also promoted by others as Digital Phase Converters. Basically a VSD is an electronic device that converts single phase into DC and then into 3 phase AC for motor control applications. VSD's are not at all new and have been around many years, and are used extensively in industrial and pumping applications. We do sell VSD's and have applied many units ourselves for suitable applications. Our Sure Power system also utilises VSD technology in part of the design. Most off the shelf VSD's used in single to 3 phase conversion applications are limited in size to 2.2KW or 3HP. The input voltage supplied is the maximum 3 phase output voltage that can be obtained. For example, 240V single phase input will provide 240V, rather than 415V, 3 phase output. VSD's are designed for single motor applications, and have the ability to control the speed, acceleration, de-acceleration of the connected motor. VSD's are usually connected just before the motor, and on many machines, will require an electrician to install, program and reconfigure the connected motor to operate on 240V rather than 415V three phase. Being fully electronic, a VFD has limited overload capability and if a motor is switched on via a contactor or switch from the output of the VFD, the VFD needs to be dramatically over-sized to allow for the inrush start current required. Despite what some sellers would like you to believe, using or connecting a VFD is not as simple as turning it on and connecting the output to the a machine that is designed to work on 415V. The output of a VSD is NOT true sine wave 3 phase. It is modified (or very course) sinewave or even a square wave, that can vary in frequency, shape and amplitude and is designed to effectively run motors. The control systems of many three phase machines, particularly those with control transformers or electronics, may have real issues working from the 3 phase output of a VSD. VSD's can also distort the incoming sine wave and create electrical interference in control systems, radio's and even telephones. Therefore they should always be installed with a line filter/choke on the supply side and shielded cable going to the motor or load. The foreword of Australin Standard AS 2279 states; “Electrical equipment should not be permitted to affect adversely the supply network characteristics, the supply voltage, or the performance of any other equipment connected to the supply network to which it may be connected. Provision must therefore, be made to limit such disturbing effects to achieve electromagnetic compatibility (EMC) between this equipment and other electrical equipment”. VSD's do not provide a neutral output and are not designed to run other single phase loads on machines like lights, control circuits, solenoids, single phase motors etc. Generally, it's one VSD to one motor. Also note, that there is often significantly more audible noise created from motors running from VSD's. VFSD's are designed to run motors and not to be idle with no running load connected. Normal installation requires them to be connected to a motor and to the incoming supply at all times. The ‘go’ command is given by an external switched input and the VSD will ramp the motor up to the preset speed. Consequently this can pose an issue powering up machine control circuitry as 415V is NOT constantly available to power transformers, control circuits, DOL motors and other 415V equipment that may need to operate. Usually you will need one VSD per motor or machine, which can make setting up a typical workshop with multiple machines a complex and expensive proposition. While VSD technology is common and relatively cheap because of high volume manufacturing, there are real world limitations and hidden costs that should be taken into account. Single motor applications are best suited to VSD technology and gives the user ability to soft start the motor and control the speed. Small motors can usually be reconfigured to operate on 240V three phase, but often machine control circuits, particularly those machines without a neutral connection, still need 415V to operate the controls and contactors. If so, modification to the controls will also be required, and may typically require a change of transformer or contactor coil or possibly more. These are often the hidden costs that should be considered before committing to the VSD option. Three phase input VSD's can also be used where larger loads need to be run. To do this successfully, the single phase supply voltage needs to be boosted and applied to the VSD which must be significantly over-sized, well above the connected load. 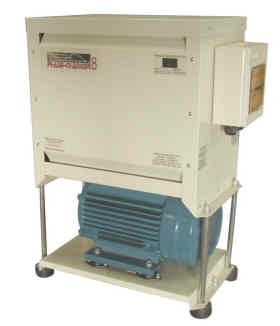 Some 3 phase machines incorporate a VSD for motor control. Running a VSD from a the output of another VSD being used as a converter, is another problem. There are definitely cases where a VSD is the best solution for a 3 phase machine or motor, and we can offer a complete VSD based solution, from small to large loads that is designed to suit your application, without the surprises. Click here for information on economical VSD's carried by Phase Change Converters. We can package and pre-program these units to suit your application to make installation as simple as possible. Contact our office for an excellent technical paper on the application and use of VSD's on single phase systems. The information provided is general and applies to most brands.